Douglas Smith Photos, News, and Videos | Just Jared Jr.
Logan Lerman and on-screen brother Douglas Smith hit up the premiere of Percy Jackson: Sea of Monsters held at The Americana at Brand on Wednesday night (July 31) in Glendale, Calif. The two actors were joined by co-star Alexandra Daddario. In a fan Q&A earlier in the day, Douglas chatted about having one eye in the film as cyclops Tyson and what he would do if he only had one eye in reality. “If I only had one eye, I would go somewhere people don’t care about my appearance. Maybe work at a blind clinic,” Douglas shared. FYI: Alexandra is wearing a DVF dress with Jimmy Choo heels. Grey Damon puts Brandon T. Jackson in a choke hold as they continue to film on Percy Jackson & The Olympians: The Sea of Monsters in Vancouver, Canada on Monday afternoon (May 28). While the two filmed their scene, Alexandra Daddario and Logan Lerman watched from the sidelines. Douglas Smith, who plays Tyson, grabbed a snack. Curious about who Grey is playing in the movie? So are we! Follow Grey on Instagram to check out his picture clues and let us know which character you think he is. Check out your first glimpse of Stanley Tucci on the set of Percy Jackson & the Olympians: The Sea of Monsters in Vancouver, Canada on Tuesday afternoon (May 22). Joined by Leven Rambin, Alexandra Daddario, Douglas Smith and Brandon T. Jackson, the cast got to work on a dinner scene at Camp Half-Blood. Recently celebrating her 22nd birthday, Leven just uploaded some fun pics to her Instagram account — including a cute one where pal Grey Damon stopped by. “#percyjackson/hungergamesfansarethebest,” she also posted. She’s absolutely right! Jake Abel waves to the cameras as he wraps filming for the day on Percy Jackson & The Olympians: Sea of Monsters in Vancouver, Canada on Tuesday (May 15). The 24-year-old actor plays Luke in popular film franchise, opposite Logan Lerman, Brandon T. Jackson and Alexandra Daddario. 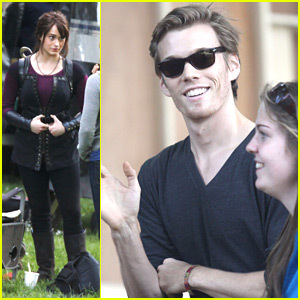 Leven Rambin and Douglas Smith were also spotted on set, filming in Camp Half-Blood. “Bullseye has taken on new meaning this monday morning on set of #percyjackson as cyclops and colchis bulls meet,” Douglas tweeted earlier.